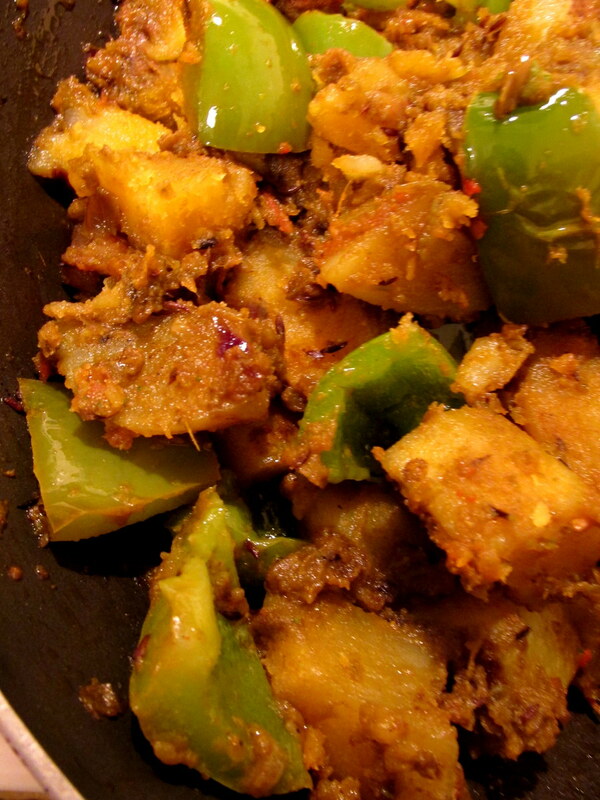 You know know you are completely out of ideas when you are cooking aloo capsicum for dinner. I mean really out of ideas. This is one dish every well almost every Indian must have tasted at some point of their lives, and more if they have spent some time in hostels, mess etc. I remember during my hostel days, in all places of London, I was served this sabzi at least once if not more times in a week. Funnily enough, how two vegetables, neither indigenous to India, have been so smartly adapted to the Indian pallet. Yesterday was very busy for us, work, bank, car trouble to sort, then work again, closet cleaning, believe me that is hard work . The cold did not help anymore either. By the time the clock struck 8:30 pm , I realised I had nothing ready for dinner. So something had to be done, since it had been snowing, take away was not happening, they all refused sigh 😦 . The husband sweetly volunteered to cook pulao , but you need some thing else with it, something quick, easy and vegetarian, ( we do vegetarian on Tuesdays) ; All I had was a few bell peppers (Capsicum) and some potatoes. 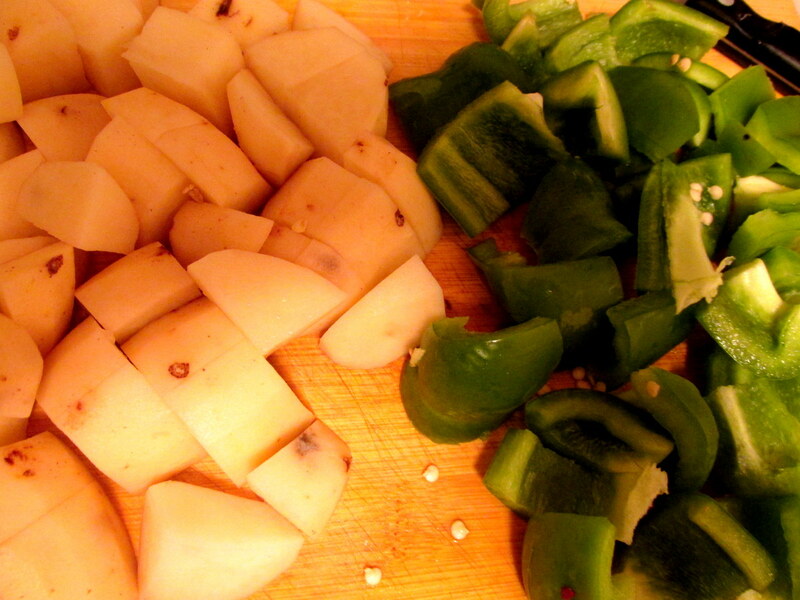 A quick stir fry is not bad, except, potato and pepper by itself is quite bland so I had some work at hand. At then end of it, it turned out pretty decent and I had a little left over for today’s lunch box, which as I write , I have it rolled into a chapatti to eat on. Peel and wash the potatoes. 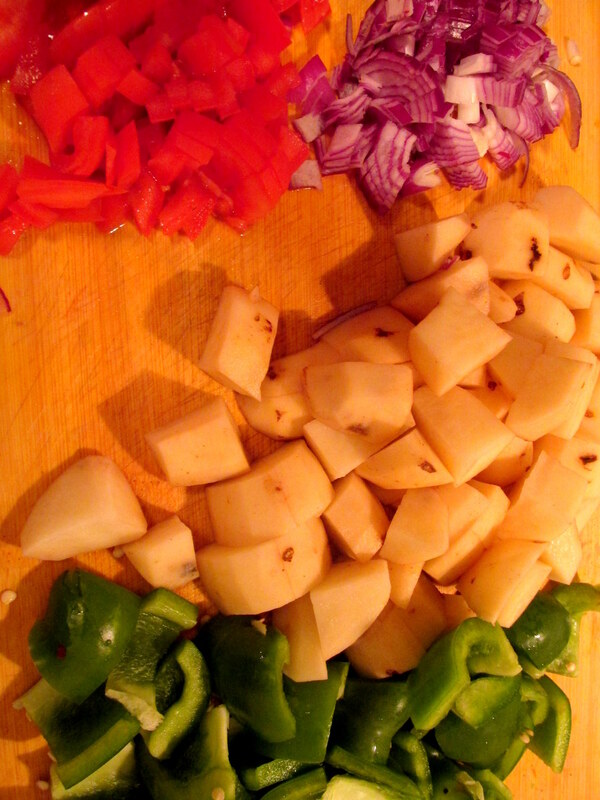 Chop the potatoes to medium size dice shape. Next chop the onions into medium size square. Heat oil in a wok or kadhai. Add a table spoon of ghee to it. Once the oil and ghee are ready, add the cumin , once it starts to splutter and release the aroma, add the onions and saute till it turns light brown and translucent. Next go in the tomatoes and green chillies, continue to cook till the onions have gone all pulpy and almost mushy. After the tomatoes are cooked , add the powdered spices, I call them my known devil as they are practically a part of many of the dishes I cook. Cook the spices for ab0ut 2-3 mins, you should notice the oil separating. 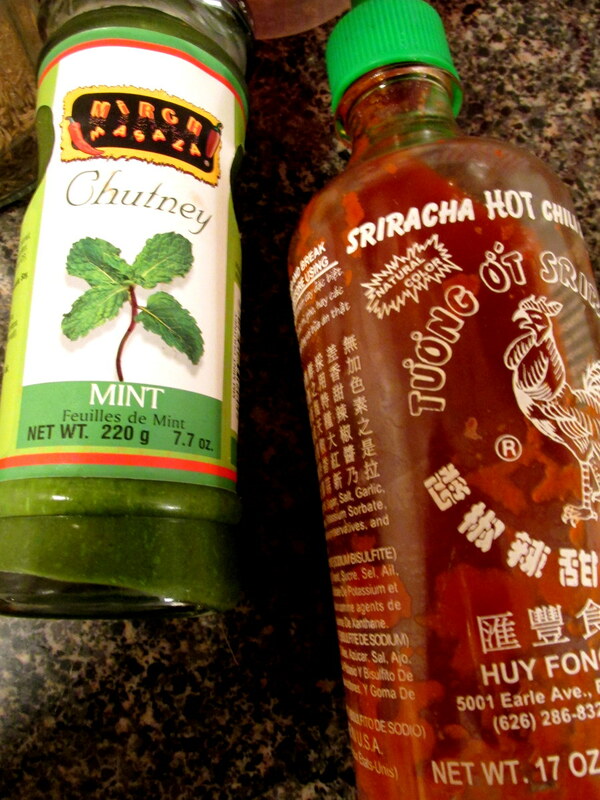 next add the mint chutney and the sauce , I did this to add a little flavour and punch to it, you can skip this step and add the potatoes and salt. On adding the potatoes, add about half a cup of water and cover it and cook for about 15-20 mins at medium heat. Meanwhile, heat a frying pan or a small wok with a table spoon of oil and saute the pepper till it looses the rawness and turns crunchy, should take 5-7 mins on high heat. As the potatoes are almost cooked near about 20 mins from the time water was added, add the pepper and stir on for about 3-5 mins on high heat. The potatoes should be cooked perfectly, neither too hard nor soggy or mushy. You could finish it off with a coriander garnish and some lemon juice. Serve it with roti or pulao. Notes: The husband did cook, mixed vegetable pulao and it turned out rather nice, the Potato Pepper worked great, with it. Pulao recipe ( the husband’s way) coming soon.